Which among the following is false about Peutz-Jeghers syndrome? This is an autosomal dominant disease characterised by melanosis of the mouth and lips and multiple hamartomatous (benign tumour-like malformation resulting from faulty development in an organ) polyps in the small bowel and colon. 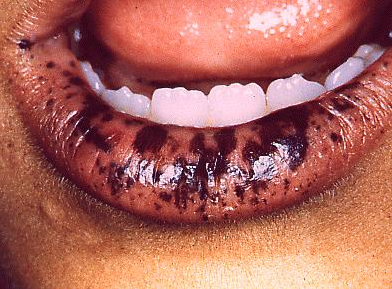 Melanin spots can also occur on the digits and perianal skin. (3) family history of Peutz-Jeghers syndrome. Malignant change in the polyps rarely occurs and, in general the polyps can be left alone. Todays Facebook Winner is Madeeha Fajish, receiving a FREE Mock Test from GateToMedicine. You need to send us your email id to customercare@gatetomedicine.com. Congratulations!